A Tisket, A Tasket, More Than An Easter Basket! Good Friday, Happy Easter Everyone! In the spirit of this great pastel-fabulous, Peeps eating holiday I thought it would be fun to feature baskets and bins. Okay, I am 100% guilty of tossing the endless amounts of plastic toys and stuffed animals we have into big natural woven baskets I have around the house which I’ve designated for kid-stuff. It’s unorganized yes, but because it requires almost no time it is a simple way for me to feel like I’ve reclaimed my house at the end of the day. (this routine is often followed by the uncorking of a nice Zin!) At least until the break of dawn when the toys start to fly once again. 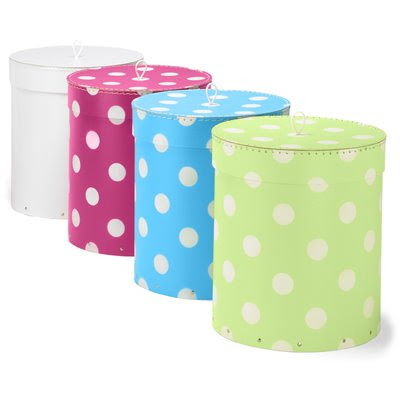 These Calypso Round Bins are so bright and fun and could also be used as a hamper. 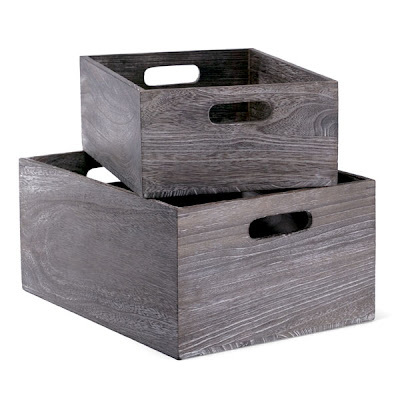 Okay, if the cutesy polka dots are not your thing (i get that) then maybe you’ll like these lightweight wood boxes in a great distressed stain. They are also from the Container Store. Inexpensive but down right cool looking. Place them on a modern bookshelf, on top of an armoire or in the toy closet for super organized style. I need these. We recently celebrated my daughters birthday and the toys keep piling up. Thanks for the great find. I need bins for every room now. Keep the suggestions coming!